Sleeveless, lined dress with above normal waist, full skirt, hem ruffle and back zipper closing. 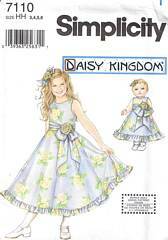 Matching dress pattern for 18 inch dolls is also included. Girl's Sizes 7, 8, 10, 12 and 14 are all included. Pattern is uncut and complete. Copyright 2002 and now out of print.